A team of over 100 scientists, experts and environmentalists will be counting brown bears in Bulgaria's Western Rhodope Mountains on October 26-27. The size of the brown bear population will be determined using bear footprints, biological marking and bear dens, Dnevnik daily reported. The initiative is being launched by the Ministry of Environment and Waters, the Ministry of Agriculture and Food, a number of non-governmental organizations and the Bulgarian Academy of Sciences (BAS). The count is aimed at establishing the size and density of the brown bear population and its habitat. The exact total number of brown bears cannot be determined because they roam a lot in the forests in search of food and sometimes even leave the territory of the country. The bear count will be carried out on 49 routes. Last year's monitoring produced around 550 brown bears. The final data from the 2011 count will be available in end-October and will be published in the beginning of 2012. 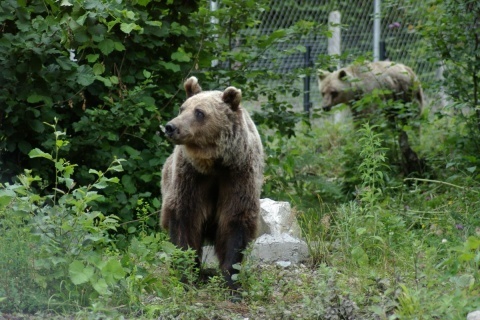 The figures from this year's monitoring will be used to improve brown bear management. In March 2011, Bulgaria's Environment Ministry launched a project titled "Plan for Dealing with the Brown Bear-Human Conflict" to address the 2010 incidents of killer bear attacks. In 2010, there were two cases of killer bear attacks on people in Bulgaria's southern Smolyan District in the Rhodope Mountain, one of them lethal, as well as a number of attacks on domestic animals. The plan was drafted in cooperation with the State Forestry Agency, which is part of the Agriculture Ministry, and several NGOs. The measures to eliminate the "human-bear conflict" included providing electronic monitoring devices and cameras to follow the population of brown bears, instructing local on how to treat them, removing dump sites that can attract bears close to villages and towns, planting fruit trees to provide additional food source for bears, etc.